Ah....The Jumpsuit either you love it, hate it, or more recently--are confused about how it has appeared in almost everyone’s fall and spring collections and more recently invading the Red Carpets. Known as a 1970s Disco favorite that flattered model-esque body types. This season designers like Giorgio Armani are now hoping to change its not-so-friendly reputation.Today, by utilizing different shapes, textures, and embellishments, the jumpsuit has been made over to appeal to a wider variety of women. In other words, you don’t have to be a model to look good wearing one. Originally designed for skydiving purposes, jumpsuits were made famous by Elvis Presley, who bedazzled the one-pieces in the disco era. Decades later, Jennifer Lopez brought back the trend by wearing a Frankie B. jean version on her J.Lo album cover. Voluptuous vixens like J.Lo and Kim Kardashian have the right idea, using the style to play up their curves with confidence rather than hide them with wide-legged pants. If you’re small busted stay away from strapless styles. While a great feature of the jumpsuit is that it creates a long, sleek perception of the body, it can also mute your curves. To ensure that your top half doesn’t lose its shape, pick a jumpsuit that creates different dimensions with fun sleeves or collars. If you have a small torso, choose a jumpsuit that doesn’t have a detailed waist, no chunky belts, ties or anything that highlights where your top half ends and your bottom begins. Keeping away from styles like these will keep your body from looking unbalanced. If you have a long torso, the opposite is true for you. Having a belt or even subtle stitching that indicates a division between your two halves is best. Just be mindful of the placement, whatever the detail, it should fall a little above your hips to balance the length of your legs and torso. If you have small hips, instant curves are just a belt away! Wrap a skinny or wide belt to create that hourglass shape so many of us desire. 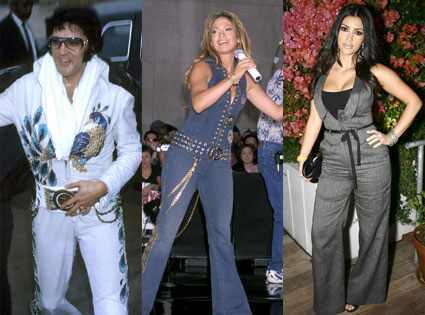 If you have big hips, pick a jumpsuit that doesn’t have tapered pant legs. The more drastically the jumpsuit comes together at your ankles, the wider your hips will appear. Jumpsuits magnify curves, so use them to your advantage like Serena. Remember fashionistas, the key is balance, balance, balance, especially for a jumpsuit because it's a one-piece, it really must fit and be styled perfectly.